Pune is known for historic sites, museums, shopping, nature, and parks. Your plan includes some of its best attractions: take in the spiritual surroundings of Dagadusheth Halwai Ganapati Temple, explore the historical opulence of Sinhagad Fort, see the interesting displays at Raja Dinkar Kelkar Museum, and admire the striking features of Aga Khan Palace. To find more things to do, other places to visit, where to stay, and more tourist information, you can read our Pune trip itinerary planning website . The Route module shows you all the different ways you can get to Pune. Wrap up your sightseeing on the 22nd (Wed) to allow time to drive to Kamshet. Start off your visit on the 23rd (Thu): explore the activities along Uksan lake, kamshet and then get outside with Outdoor Activities. To find reviews, other places to visit, more things to do, and tourist information, you can read our Kamshet trip planner. Traveling by car from Pune to Kamshet takes 1.5 hours. Finish your sightseeing early on the 23rd (Thu) so you can travel to Khubi. On the 24th (Fri), contemplate the long history of Harishchandragad Fort and then hike along Malshej Ghat. Ask Inspirock to suggest an itinerary and make planning a trip to Khubi fast, fun, and easy. You can drive from Kamshet to Khubi in 3.5 hours. Finish up your sightseeing early on the 24th (Fri) so you can travel to Bhimashankar. 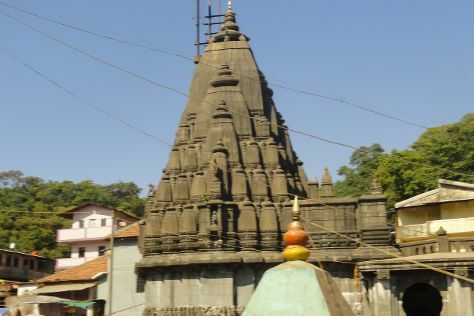 Bhīmāshankar Temple is a Jyotirlinga shrine located 50 km northwest of Khed (alias Rajguru Nagar), near Pune, in India. Kick off your visit on the 25th (Sat): take in the spiritual surroundings of Bhimashankar Temple. To find more things to do, photos, where to stay, and more tourist information, use the Bhimashankar planner . You can drive from Khubi to Bhimashankar in 3 hours. Expect a daytime high around 39°C in May, and nighttime lows around 31°C. You will have some time to spend on the 25th (Sat) before leaving for home.